This screenshot from TV21.ru shows seven armed FSB border guards in camouflage cloaks at the North Pole. Armed FSB Border Guards from Murmansk were exercising in extreme cold in four days on top of planet earth. Russia is positioning itself as the dominant master in Arctic security. Less than two weeks after President Vladimir Putin and three ministers visited Franz Josef Land, a troop of Border Guards from the Kola Peninsula brought their weapons even further north in a show-off to reaffirm Russian presence in the Arctic. 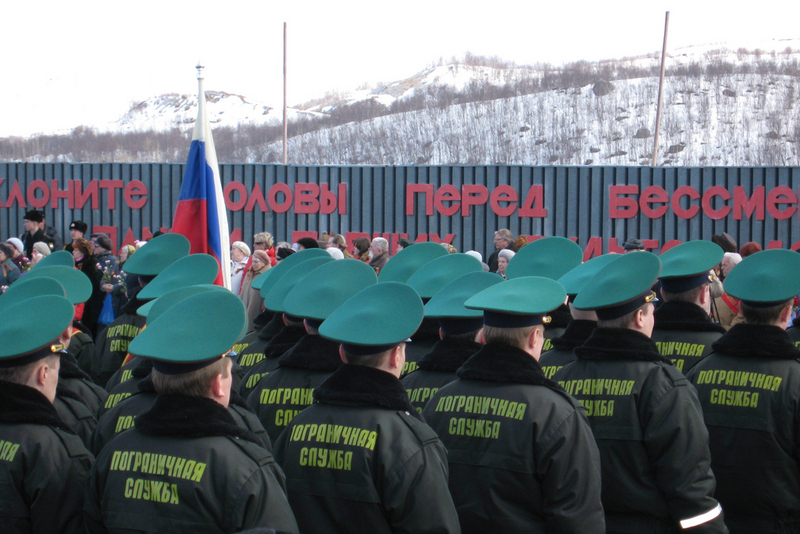 FSB Border Guards in Murmansk region are normally patrolling the borders towards Norway and Finland. The Border Guards first went to Nagurskoye airfield on the northernmost tip of the island of Aleksandra on Franz Josef Land. Here, Russia has its northernmost Border Guard post. The troop got acquainted with polar dog-sledding before flying further north to Camp Barneo, a Russian temporary ice base at 89° north in the Arctic Ocean, TV21 in Murmansk reports. A reporter from the regional TV station met the participants at the airport in Murmansk as they returned from the North Pole earlier this week. In the reportage, film from the expedition shows how the border guards were exercising both at the airfield at Barneo, including snowkiting with automatic assault rifles. TV21’s film is also posted on YouTube. Another photo shows the seven armed FSB soldiers at the actual North Pole. The flight from Camp Barneo to the North Pole takes less than an hour by helicopter. It is Longyearbyen, the administrative center in Norwegian archipelago Svalbard, which serves as logistical base for the few weeks the Russian Camp Barneo is operating. An agreement between Svalbard Governor Kjerstin Askholt and Aleksandr Orlov, Vice President of Russian Association of Polar Explorers, was reached on 13th March, as previously reported by the Barents Observer. That agreement did not come by itself. According to chief operations officer Irina Orlova, negotiations had proceeded for half a year and on several levels. After last year’s Barneo camp, the Russian organizers announced that they were moving all logistics to Franz Josef Land. The dispute with Norwegian authorities appeared after it became clear that the Russian Armed Forces planned to use the Longyearbyen airport for bringing in military instructors to an airborne drill in the Arctic. Similarly, Chechen Special Forces, headed by Ramzan Kadyrov’s aide on law enforcement issues Daniil Martynov, used Longyearbyen airport in their preparation for “Flying Squad” combat group’s North Pole military exercise. In 2015, Russia’s Deputy Prime Minister Dmitry Rogozin’s visit to Svalbard on his way to Barneo and the North Pole created diplomatic tensions between Norway and Russia. Rogozin is on EU and Norway’s sanction list against Russia and is consequently a persona non grata on Norwegian soil. The Norwegian Ministry of Foreign Affairs said that Rogozin’s visit to Svalbard was not illegal, but that it had told Russia that blacklisted persons are not wanted at the archipelago. Returning from Barneo, the border guard soldiers landed at Murmansk airport on board an An-72. According to the reportage on TV21, the FSB Border Guard troop came from Barneo to Murmansk.